I know its been talked about before, the topic on changing training on introducing more new stuff instead of just obbys, sfts, and all that crap that I don't like, I've found what we need most in training, and that is leadership. I went to a FCO tryout and our orders were to come up with a strategy to defeat the opposing team. but my team made it clear that FEAR isnt good at all with coming up with strategys or coordination at all very much. and this will be the downfall of fear and it needs to be fixed and there needs to be divisions and train in coordination and teamwork other than "who has the highest KDR and rank"
I highly agree with the fact that FEAR has an issue with good leadership and tactics. The fact of the matter is that right now we can't coordinate a way for leadership to just spawn up by telling them "come up with a plan" and expect them to effectively make one without having any flaws. 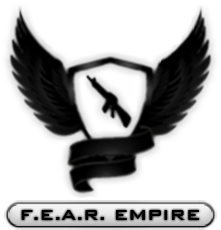 Now if it were at any way possible to insure that FEAR members could even begin to grasp the fact of leadership and tactical advantages then that will be the day when FEAR changes forever. We just need more ways to help them spawn up their courage and release their inner leader.